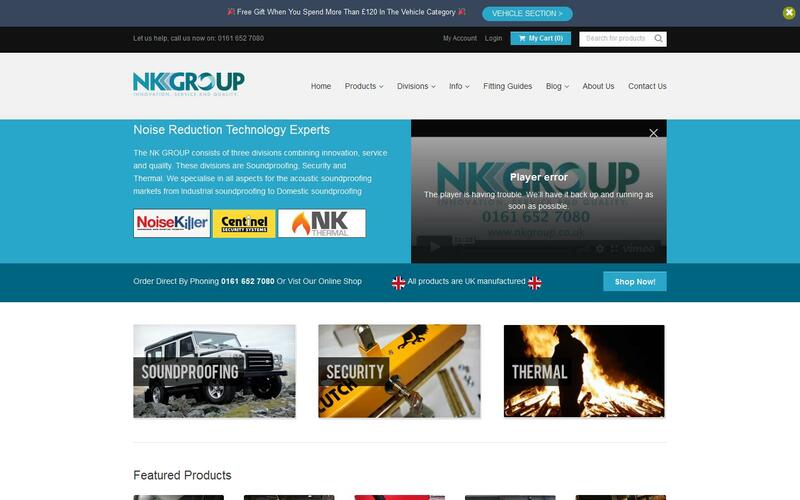 NK Group is built up of three divisions - Soundproofing, Security and Thermal. We are UK leading experts in Soundproofing equipment for both Industrial and Domestic customers. NK Group trade under the name Noisekiller which was formed to supply Vehicle, Marine, Industrial & Domestic markets with a range of highly effective sound proofing materials. Noisekiller work with a wide variety of customers including BBC, Local Government, MOD, Police & other motoring organisations to solve all there Noise concerns. Our other division ‘Noisy Neighbours’ provides households with soundproofing technologies so you can enjoy your home without any disruptions. We serve both new and old buildings. NK Group are proud to manufacture all of our products here in the UK. This enables us to work within short time scales and offer a bespoke design service so suit your individual needs. NK Group manufacture soundproofing and noise reduction kits for many types of vehicles including Cars, Vans, VW Campers, Land Rovers, Motor Homes & Taxis. We cut each soundproofing material to shape to meet your exact needs. Centinel Security Products offer the very best security products for your vehicle. We can provide you with a range of ground anchor posts to prevent theft of your car, motorhome or caravan etc. Centinel Clutch Claw for protecting your vehicle from being stolen and driven away when you are away from home. NK Thermal have an excellent reputation around the world for our quality fire protection products and noise reduction acoustic blankets. All products are manufactured using only the best thermal materials. Orders can be placed over the phone or through our Online Shop. Back in 1948 ,the original Land Rover Defender was originally designed to travel over fields on farms. 29/01/2019 - Does a clutch claw fit an automatic vehicle ??? This is a common question we have been asked for for many years! 14/12/2017 - Use Code ABXMAS17 for 10% discount!